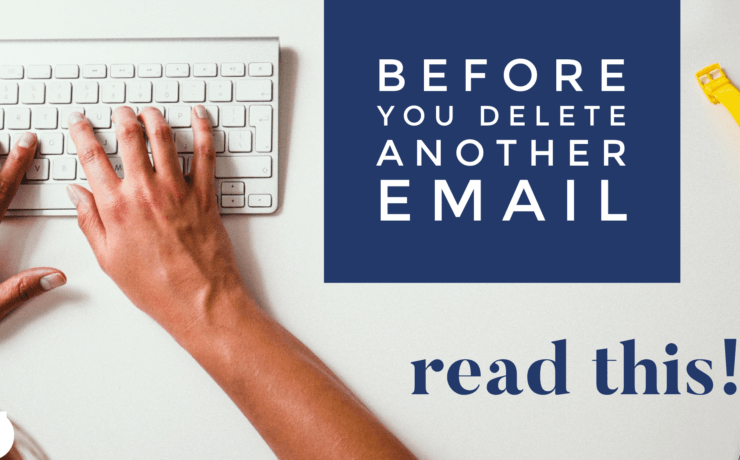 Before you delete another email, Read This! Email inboxes have become another annoying source of clutter in our lives, requiring management and strategic planning to tackle them. Although removing the noise from our inboxes stops the mental overwhelm, I’ve discovered there are some emails you should never DELETE. I recently attended the funeral of a ninety-four-year-old woman. I didn’t know her personally but she was my friend, David Altshuler’s mother. David’s son, Ellery, was the first speaker to deliver the eulogy. He seemed like a nice, educated and articulate young man. I thought it was quirky that Ellery referred to his grandmother by her actual name, Thelma. People don’t normally call their grandmothers by their first name. But after a few sentences escaped his lips, I knew there was nothing ordinary about this grandmother. I quickly discovered that Thelma was an excellent writer with high standards and that she was always available to help Ellery with his school papers. She was a highly educated and successful woman. I expected to hear all about her accolades and accomplishments, which I gathered were significant. But Ellery’s speech went in a different direction. He took us all on a journey of Thelma’s life by reading emails she wrote to him dating back to 2004. Every email on its own might have seemed unremarkable and insignificant, but coupled with Ellery’s commentary and the context he provided, each one brought the audience closer to his grandmother. This was Ellery’s way of showing us who Thelma really was. Ellery mentioned how he and Thelma enjoyed literary realism. He referenced a few books and noted how those authors reminded you of the profundity found in everyday life. He did an outstanding job at displaying the depth of his relationship with his grandmother by allowing us to peek into their ordinary, yet hilarious, string of email exchanges. Instead of hearing about her awards and recognition, we learned about her constant battle with her printer and its toner, her obsession with compression socks and free parking, and her keen ability to complete the New York Times crossword puzzles. Suddenly I felt so connected to this woman I didn’t know. Her brilliance, her zest for life, and her love of literature, music, art, and humanity mesmerized me. Her independence and character inspired me. And the special relationship she formed with a boy sixty-nine years younger than her left me in awe. She was more than his grandmother; she was his best friend. By the time Ellery finished reading their email exchanges, Thelma had become my friend, too. She was exactly the kind of old lady I aspire to be. Connections like the one Ellery and Thelma had are not lost or broken by death or distance. She influenced his life in a way that will manifest itself in every aspect of Ellery’s life until he dies. Plus, Ellery has something precious; He has the gift of his grandma’s written words. Thelma’s emails were just like the postcards my dad sent me. She established a form of communication with her grandson and then communicated with him consistently. Through her emails, she stayed present in Ellery’s life no matter where he lived or what stage of life he was in. Some of my favorite emails involved questions Thelma asked Ellery regarding sports. Unknowingly, Thelma took part in the postcard promise. And because Ellery never deleted those emails, his inbox became a box of postcards. Even though she is no longer physically present, Thelma will always be with Ellery even when she’s not. I met Ellery after the service and told him how moved I was by his eulogy. I also shared with him my personal experience with my dad’s postcards and how even now, three years after he passed, I can pick a postcard from the bunch and his words are still relevant and meaningful. I can’t emphasize it enough. Write to your loved ones! Whether it’s postcards, letters, emails, or post-it notes, written words are powerful, even when they appear insignificant at the moment. That evening I returned home from the funeral and this is how the conversation with my husband went. Orlando: How was the funeral? Me: It was amazing! I am so inspired. Orlando: You realize this is not how this conversation should go right? Orlando: Caro, funerals aren’t amazing. They’re sad. You’re insane. Me: Well, you haven’t been to Thelma’s funeral! The next time you’re sorting through your inbox and removing all the clutter, make sure you stop before deleting emails from the people you love. Create a folder for them; Archive them; But don’t delete them. It may seem like you’re being lazy now…but one day it might just be a streak of genius. well done…….many thx for your thoughts on this subject. You’re welcome, Seth. Great to hear from you. Loved it, I know Ellery since he was born, and knew Thelma when she was my 80 year old father’s teacher at Miami Dade College. What a beautiful connection. Alma, thanks for sharing. Their connection is definitely very special. You said you wish you were connected to your grandchildren like they were. I believe that as long as we’re alive, we can always work toward creating those kinds of connections. Communicate with them consistently and stay involved in their lives. It’ll happen for you too.